Here I got few pictures, my daughter just sent them to me. 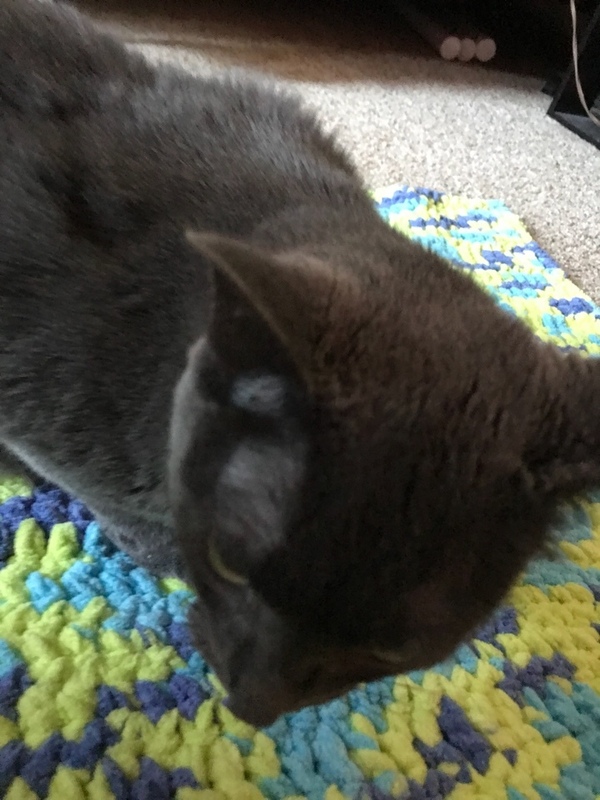 Here is a Maliki (one of her cats) on a blanket/pad that I made for her before Christmas. I made two of them, I am waiting for another picture. That blanket is made out of Bernat Baby Blanket Yarn - very soft & thick:). My daughter got 2 cats & one little dog. Each of them got a very weird name! LOL. Like Pandora, I call her Pandy. Who on earth names a cat Pandora? . Maliki is not the whole name either, I just call her that. My daughter could not even take those pictures with right side up. I guess that would be way too much to expect from her LOL. That blue edging shows a lot better/nicer on right side. Here is another picture. The dog wake-up and wanted to take away that blanket from that cat. She have to put that blanket on a step-ladder LOL. Maliki looks very comfy on her new blankie! Adorable! I do remember you made that blanket for your grandson, I think before he was born. At the same time I was making two blankets out of that yarn (different color) for two of my friends grandkids. My daughter just called me with her "great idea's".. LOL. There is a pet shelter close to her condo. She said it would be nice if I would make a lot of those blankets for those animals ( same yarn), they would love them!. And there is an old lady with two little dogs living in the same condo-building. Her condo is on the first floor and she took out all the carpets from her floors & got a tiles everywhere. My daughter says: those dogs could use that kind a thick & fuzzy blankets too!. Besides that she want me to crochet a Igloo for her little dog. That dog is always cold, her fur is so short. She looks almost naked :( . PS: Long time ago I did seen a picture somewhere of a crochet Igloo, I will try to look for that. If not, I will design my own Igloo LOL. 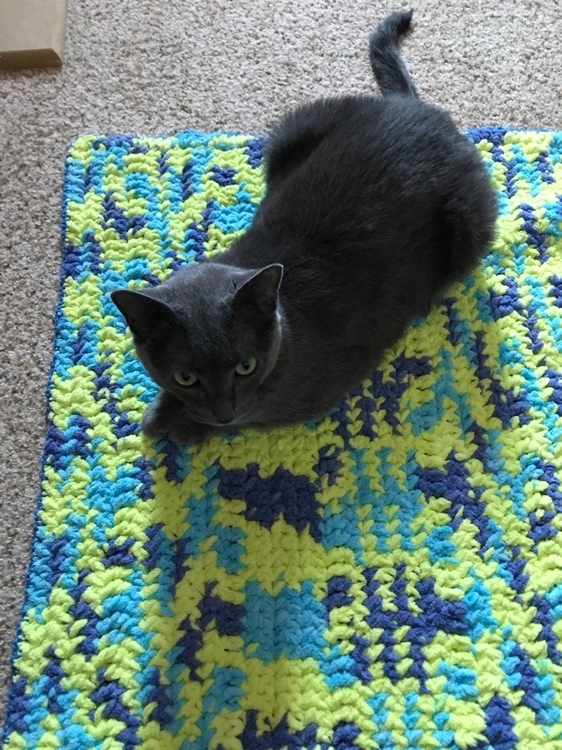 Krys love seeing the black kitty all happy and comfy on the blanket you made. She looks very happy and comfy. It is so nice to know that your work is appreciated. Oh! Maliki is so beautiful! He looks so much like our little baby!! He passed 4 years ago, and I still miss him!! Kiss your baby for me! Its so bright and soft looking. I can see kitty likes it. About your daughter's idea, you said you hate to crochet the same things over and over. Can you make these blankets over and over? I know how you feel about that. Sometimes I start a pattern and its fun and I think I could make this forever! But later I am so sick of it haha. Looks like kitty really likes her pretty blanket. Nice blanket and we may see the cat likes it! Yes, you remember well:). 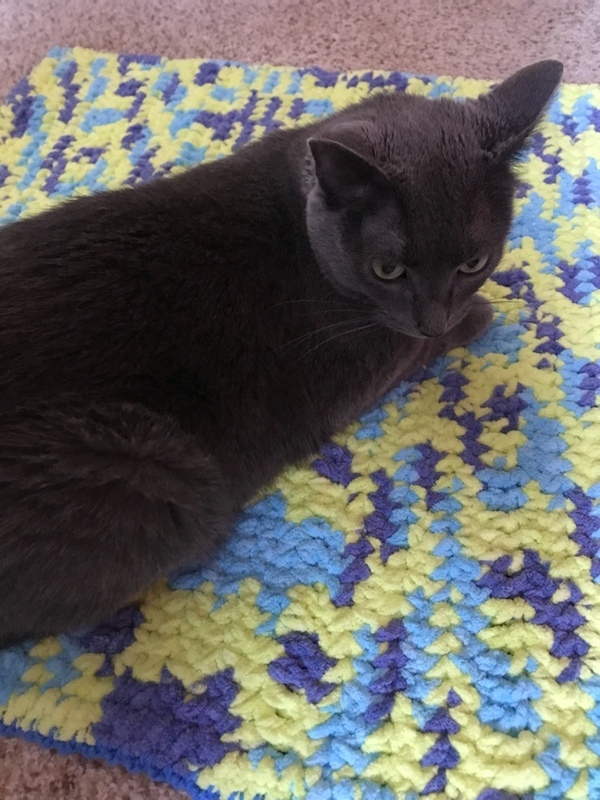 I do not like to crochet same thing over again. But if something is simple and dos not take much time I probably would not mine that much. 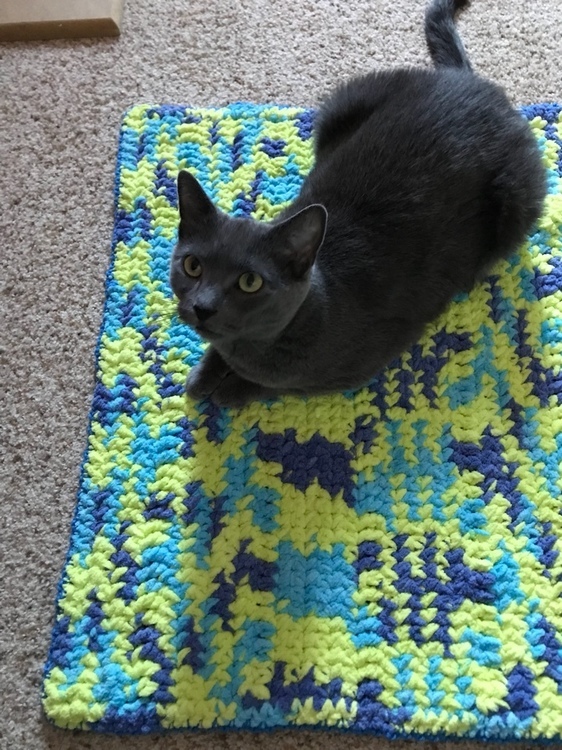 Specially since those pet blankets can be crochet in different color and different shapes for a change. I do not even know how many of them my daughter would expect me to make for that pet-shelter?. That is a big shelter, they have a lot of animals there. I hope she is not thinking about couple/few dozens for me to make . Because that is not going to happen. I do donate money to that shelter about twice a year. Each time I am getting cash for points (they give me points for my purchases) from my credit card I am writing a check to that shelter for all that amount. I am considering that is a "free money" I am getting. So, I might as well help those poor animals with that.. Couple months ago I donated to that shelter a lot ( big bag) of brand new beautiful pet-toys. Most of those toys are from friends for Cesar (my little dog). And most of those toys are way to big for him to play with. And sometimes when I buy him toys he dos not like some of them. They do have their "own taste" LOL. They do know what they like and what they don't! Right now I am thinking about that Igloo for my daughter dog. I did try couple swatches out of that baby blanket yarn. 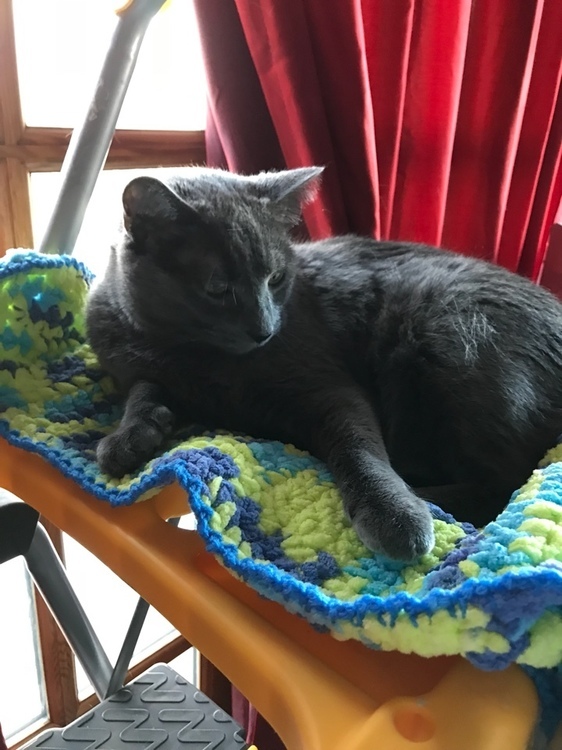 I did find out that I will need to use two strands of that yarn and crochet very tight for that thing to have any chance to be able to stay up and not collapsing. That will not be a fast or easy on hands project to make:(. Yesterday I got some pictures of that second blanket I made. That one is round. I will post that. How is that winter working for you in WI?. Probably not very well. Thank You Ladies:) And a BIG THANKS from Maliki . Yes, she will get kisses & hugs, a LOT of them:). Haha..No...it is not working out very well. Dh had to call in to work today and spend the day thawing things out and fixing broken sewage. I will like to see the igloo!! That sounds really cool. Sounds like you have a busy winter ahead of you.